Upon learning that Gary & I were moving to Puerto Morelos, my friend Marie looked at me like I had 3 heads. Marie had been to Puerto Morelos, and didn’t really dig it. And I get it: the beach isn’t nearly as beautiful as Isla Mujeres’ North Beach, or even Cancun or Playa del Carmen’s beach. The town is small, and there aren’t a lot of restaurants. There’s not a lot to do. And although there are folks to take you out snorkeling, or diving, there aren’t a lot of excursions, shopping for pretty things or general busy-ness that you get with larger tourist destinations. …and sometimes the poverty is right there in your face, asking you for money. Why would we want to live here? But then again, we have another friend, Nick. Nick lives on Isla Mujeres. Nick wonders why we would want to live here? The qualities that we were looking for in a vacation destination are different than what we look for in a place to live. About 8 years ago, Gary and I spent a month in Belieze, and I think that trip was the catalyst in us trying to figure out how to be able to live on the beach. It started us dreaming, that IF we were to live on the beach in another country, what would that look like for us? What would we do all day? How would we make money? And so, we started the process of thinking about what we wanted our community to look like, and also, what types of things we wanted that community to have to be happy there. We started visiting different cities in Mexico. And we decided that we really liked it. Mexican’s treat their culture with a lot more respect than American’s do – the way that they honor the dead during Dia de los Muertos as well as in their cemeteries and grave sites is just an example of how they respect their culture – not to mention how distinctively refined their food and art scene is. Because there are plenty of places that I love to visit, but I don’t want to live. What were we looking for in a place to live? Okay – so, what was on our list of qualities in a place to live? MUST HAVE INTERNET – because both Gary & I work online, the internet must be reliable and be fast enough. Beach – this was Gary’s requirement more than mine. The ocean is just so grounding, and the sense of calm that ocean water brings is so much greater than living on a lake or pond. If we were going to move to Mexico, it needed to be near the ocean. The Yucatán – We really like the Yucatán peninsula, and it’s safe. What you hear about crime in Mexico is really tied to drug trafficking – from other countries south of Mexico. into the US. As long as you stay out of the path from Central America to the US, you’re good. The Yucatán isn’t in that path, so the cartels don’t really bother this area. Colonial City – we loved Merida and Oaxaca. We would have loved to find a colonial city that was on the beach. Unfortunately, they don’t exist. So, this requirement ultimately got scrapped because being on the beach took priority. The water needed to be swim-able – This requirement was created after we visited Sayulita. Since it’s on the west coast of the country, the water is awesome for surfers. Not so much for folks who just want to hang out in the water. We would like to be close to an airport – and not just an airport, but a major international airport where we could get home to the US quickly if we needed to. One place we love to visit is Isla Mujeres. North Beach is GORGEOUS and when we go there, there’s absolutely nothing to do but go to the beach and read. It’s heaven. They have some really good restaurants, and because it’s an island, we’ve always felt really safe being there. The internet is very unreliable – the last time we were there, the entire island was without internet. Someone accidentally cut the cable line from the mainland. It was out for a good 4 hours. And then, because it was out for that long, it was super slow for the next 4 hours with everyone trying to catch up on what they had missed while it was out. Even though it’s just off the coast of Cancun (you can literally see Cancun from the island), it seemed like a big production to get to Cancun if we needed anything. The ferry ride is 20 minutes, but you do have to queue up for a bit before that, and the ride in to Cancun is another 30 minutes-ish. So, it just seemed like a big obstacle that if I needed to go to Cancun to get something I couldn’t get on the island (or go to the dentist, doctor, hairdresser or movies) it was probably going to take most of a day. Instead of being able to jump in the car and go when I wanted, for me, it seemed like a huge mental barrier that we would be so isolated from everything else (the ferry runs on a specific schedule, and would add another 30-45 minutes minimum if we needed to catch a plane to get back to the states). Would the tourists drive us crazy? I think it’s one thing to be around tourists when you are one, but did we want to live among so many of them on an ongoing basis? Would we tire of over-served gringos who disrespect the town? So, we decided that we would cross Isla off of our list, but focus on other coastal towns on the east coast of Mexico’s Yucatán peninsula. And that’s when we visited Puerto Morelos. The beach is not as amazeballs as North Beach, or Cancun. However, nor does it have the obnoxious tourists that come with that, or the shop owners trying to hawk their wares. It’s a small town 1/2 way between Cancun and Playa del Carmen, which means that we can take advantage of what each of those cities have to offer without having to live there. We’re 20 minutes from the Cancun airport, and about 30 minutes from downtown Cancun. And we can drive there whenever we want because we have a car (versus living on the island & needing the ferry and then cabs to get around the mainland). Puerto Morelos is growing. Every time we visit, there are new restaurants and shopping businesses opening up, and there’s new construction for housing. So, that’s why we decided on Puerto Morelos. After 6 weeks, we haven’t found any reason for leaving here, but when considering the move, and where to land, we made the jump – rationalizing that at least it would get us TO Mexico. And if we decided that this wasn’t the place for us, we could always take day trips to other towns to explore if those were more our style. But so far, we’re good. Such a great article Elizabeth. I am one of your followers and PoMo is no secret to us. High on our list of places to live in the not so distant future. We are still exploring Mexico and have a few more place to visit before making the leap. Thanks for your blog and the great information you and Gary provide. Hey Darle! That’s great! When’re you thinking about making the leap? And what other towns are on your radar? We just returned from visiting Valladolid, Merida, Progreso. We really like those spots, but one place we did visit and really like was Chuburna. We would like to go back there a spend some time to see if that is a place we would like to live. Other places we want to visit are: Campeche, San Luis Potosi, Lake Chapala/Ajijic, San Miguel de Allende, Mazatlan, San Carlos and a few other places I can’t think of right now. We are not sure exactly when we will make the move, but our plan is to visit places over the next few years and spend up to a month in each place. We are in the process of selling our house and once it is sold, it will free us up to do more traveling. Pam and I are both retired and we really look forward to new adventures. We really like it where you and Gary landed and reading and learning through your adventures has really taught us a lot. Thank you so much for sharing and who knows, maybe in a year or two, maybe three, we may even be neighbors. Puerto Morelos is high on our list. I’ve heard amazing things about all of those places that are on your list! We only drove through San Luis Potosi, and I’m really excited to visit San Miguel – although it was never on our list of places to move to because it’s no where near an ocean or airport. Let us know when you come through again – we can connect. We just moved two weeks ago from Progreso and are thoroughly enjoying the Caribbean, the restaurants, and the people we have met. Oh! so you’re in Puerto Morelos now? Maybe we can connect. Heading down in 2 weeks for reconnaissance! Can’t wait and grateful to read your blog as it helps us with our planning. Thanks for the comments Gary! It’s starting to get a bit warm here, but it’s also low season, so it’s a bit quieter – which is nice. Staying in PDC for a few nights and then moving down to Tulum for a few — trying to get the feel of both areas. so for someone not wanting to move to mexico with a car- what is the bus system like for pomo? Hi Connie – between the buses and colectivos, you can get pretty much anywhere. Since we have a car, we don’t use them, but a lot of people do. 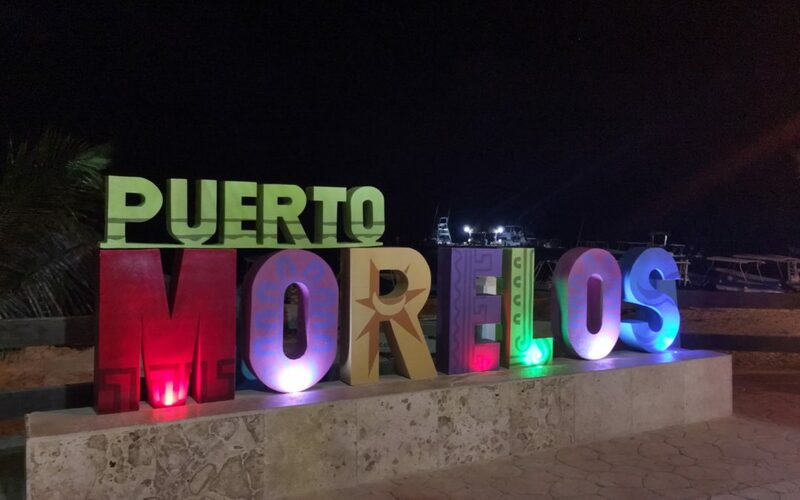 To be honest, I hadn’t had Puerto Morelos on my list of places to consider. Hubby is easy to please so it’s kind of a “me” thing right now. Like you, we will be working online and internet is a must which I see you are happy with. Do you have decent speed? I’ve gotten spoiled with fiber here as of recent but as long as it’s reliable I’m happy. Airport? Most definitely as hubby has family in VT and we have friends in other states. I wish there was a ferry from Florida though! What about weather? I had originally though Baja Norte area since I love San Diego weather but I’m not sure that’s really where I want to be. But I do know I need a break from this FL weather for sure. Thanks for this great blog, it’s been a great resource. Thanks so much for the nice comments! Our internet speeds are good. We’re on a 100 Mbps down plan. Most days we get anywhere from 30-80. It varies a lot. We still do have occasional outages, much more so than in the US, but it’s something we’re becoming used to. We’re both able to work online, with only a few frustrating moments here and there. Being close to a major airport was an important factor in our decision. There’s so much of the world we still want to see! Weather? Well, it’s hot. And humid. But that’s part of living on the Caribbean. We’ve been visiting this part of Mexico for many years, so we knew what we were getting into. Even so, there are days when it’s a bit much. I would definitely recommend spending some time in a place before deciding to move there. There’s a lot of differences depending on the time of year. Not only weather, but also high/low tourist season – the feel of a town can change a lot.